Artist unknown from the story “She Killed to Live” from CRIMES BY WOMEN #6, 1949. If he’s the rich uncle I wouldn’t eat or drink anything she’s fixed. Well, Dave, considering the title of the original story—“She Killed to Live”—I think it’s a pretty safe bet that his time with his sweet niece will be coming to a sudden end very soon. So long as Uncle Alex’s gaze is firmly fixed on those fabulous funbags, he’s not really gonna notice that “odd” taste in his coffee. 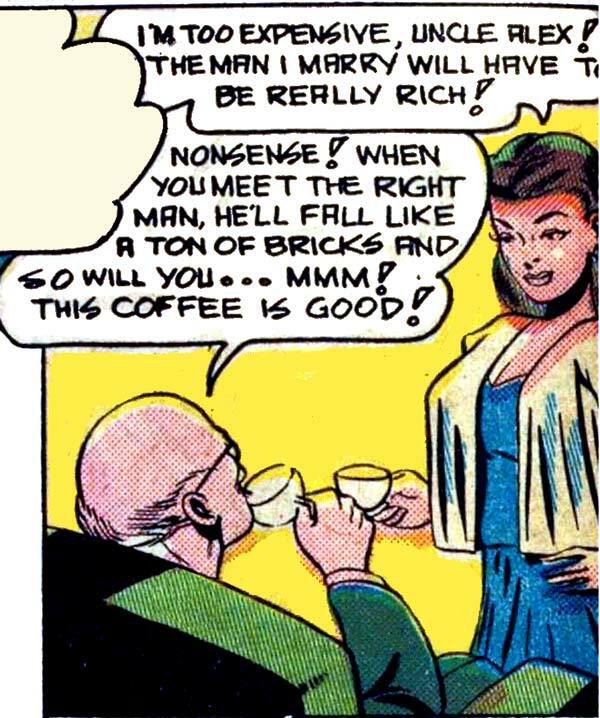 Given Uncle Alex’s baldness, she may have been putting thallium in his coffee for some time. And the ‘too expensive’ issue may be what she does for a living now, given her assets.